If you like your brisket both sweet and savory, soda may seem like an unconventional addition. But Coca Cola is the secret to this festive, fragrant, and flavorful crowd-pleaser. We love the simplicity of this recipe, and that it can be prepared in advance to produce moist, sweet meat which can be enjoyed throughout the holiday. It's a perfect recipe for Rosh Hashanah, Passover, Hanukkah, or other High Holidays. Place the brisket in a roasting pan. Put the onion, oil, wine, honey, Coca Cola, ketchup, mustard, and paprika into the work bowl of a food processor and pulse until chopped. Pour over the brisket. Cover and marinate in the refrigerator overnight. Preheat oven to 325 F/165 C. Bake the brisket, covered, in the preheated oven for approximately 4 hours, or until a digital instant-read thermometer inserted into the center of the brisket reads 190 F, for well done. When cool, thinly slice the brisket against the grain. It is very important to slice the brisket correctly. If the meat is not sliced against the grain, it will be tough. It is best to prepare the brisket a day before you plan to serve it, as the taste is enhanced after it sits in the fridge. For Ashkenazic Jews who refrain from eating kitniyot during Passover, mustard is on the list of foods that's considered verboten. It's fine to leave it out of the recipe, or to substitute another savory spice like garlic if you're making it for Pesach and prefer to skip the mustard. Serving suggestion: Make gravy with drippings from the meat. Melt 4 tablespoons of parve margarine in a heavy saucepan. Slowly stir in 4 tablespoons of all-purpose flour (use potato starch instead of flour during Passover). Cook and stir for approximately 3 minutes, or until margarine just starts to darken. Slowly stir in 2 cups of drippings. Continue cooking and stirring until the gravy thickens to desired consistency. Season with salt and pepper. 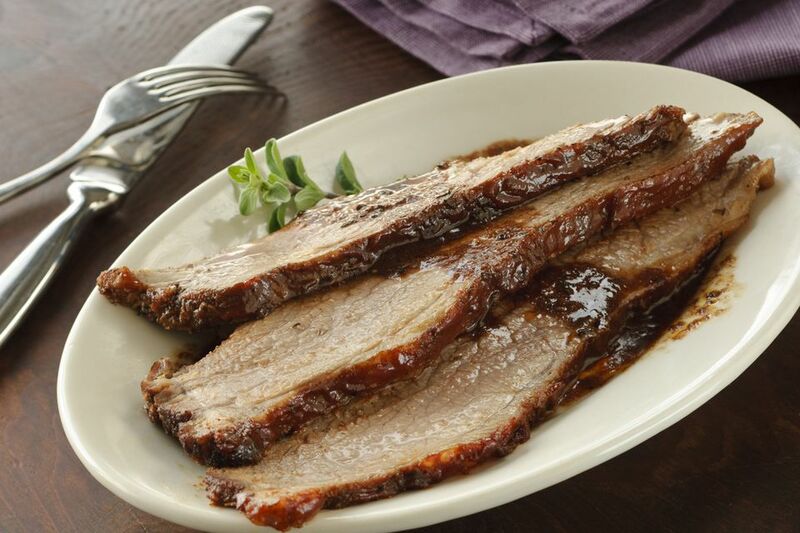 Pour some of the gravy over the sliced brisket, and serve the remainder alongside.